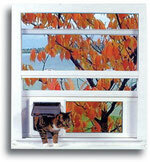 We carry all the top pet door brands, in every price range. Click the logos to see a prices and measurements for the respective products of that brand or type. Patio Pacific® pet doors feature Endura flaps, available with both single and dual flaps for added insulation. Door mount and Wall mount models are available. All are excellent quality, American made products.